On the basis of the results of a survey carried out by the Statistical Service, the total expenditure for environmental protection activities in industry in 2016 is estimated at €24,2 million, compared to €23,7 million in 2015 and corresponds to 0,13% of the Gross Domestic Product. By sector of economic activity, the manufacturing industries reported expenditures of €20,3 million, the mining and quarrying industries and electricity supply €3,8 million and the water treatment and supply enterprises €0,2 million. In the manufacturing sector, where the largest amount of expenditure was reported, manufacturing of food products accounted for €8,0 million, manufacturing of other non-metallic mineral products for €6,4 million, manufacturing of beverages for €1,2 million and manufacturing of pharmaceutical products and preparations for €1,1 million. 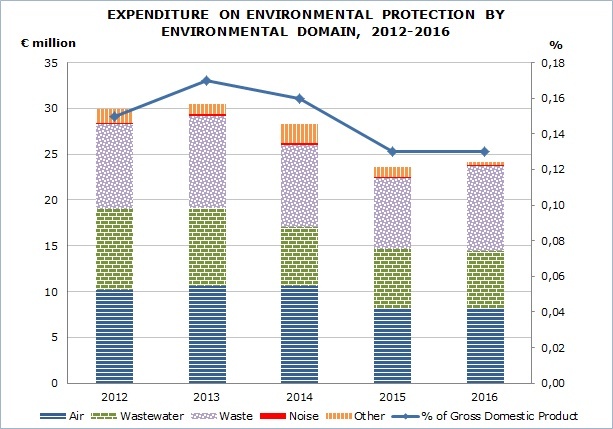 By environmental domain, expenditure related to the monitoring, treatment and disposal of waste accounted for €9,3 million, the reduction of air emissions for €8,2 million, the treatment of waste water for €6,3 million and other actions such as the abatement of noise and vibrations, the protection of soil and ground water and the protection of natural resources and biodiversity for €0,5 million. Environmental protection: is defined as any action or activity whose main purpose is the collection, treatment, reduction, prevention or elimination of pollution and pollutants or any other degradation of the environment resulting from the operating activity of an enterprise. All actions and activities where the primary function is environmental protection are included, regardless of whether they are undertaken in response to environmental legislation, to meet demands of customers, to improve company image, etc. However, actions and activities that are beneficial to the environment but whose main purpose is not environmental protection and have been taken regardless of environmental protection considerations are excluded. Examples of such activities are: treatment of waste and waste water, elimination or reduction of emissions of air pollutants, protection of soils and ground water, abatement or reduction of noise and vibration, protection of natural resources and biodiversity, as well as the monitoring of the quality of the environment and the control of waste production etc. Environmental protection expenditure: is the sum of capital investments and current expenditures for the undertaking of environmental protection activities.